The NCAA College Basketball system has been under heavy scrutiny for its “March Madness” Tournament selection process. Every year we hear about the uncertainty surrounding whether the so called “bubble teams” should be in or out of the tournament. 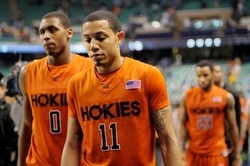 Many teams, such as Virginia Tech in recent years, seem to get unjustly snubbed from participating in the tournament that determines college basketball’s national champion. The NCAA currently relies on a selection committee made up of athletic directors and conference commissioners who are in charge of identifying the 68 basketball programs that get to compete for the nation’s title. However, no one knows exactly how the “Selection Sunday” process works. We know that 31 teams receive automatic bids to play in the tournament because they win their conference championships, which leaves 37 teams to receive At-Large bids. Beyond that, it’s all a huge secret. Membership of the selection committee: We would like to expand the selection committee to be more representative of the breadth of our nation and college basketball teams, with 100 voters rather than 10. This committee will be comprised of the members of the current committee plus those sports writers and coaches who vote in the Associated Press and Coaches’ polls throughout the year, given that these individuals deal with the teams on a weekly basis. Their ballots would be visible to other members in the committee in order to avoid strategic voting, with votes cast after internal means of sharing insights and deliberation. Before the voting: Before voting even begins, each person on the committee would be required to introduce one team that he or she thinks worthy of particular consideration and make a case for why that team deserves a bid to play in the tournament. This step would familiarize the committee with a wider pool of teams before voting actually begins. Round one of voting to pick 29 at-large teams: The first round of voting would be a ranked voting method called the Borda count that would determine the first 29 out of 37 teams to receive at-large bids. Devised by Jean Charles de Borda in 1770 to elect members of the French Academy of Sciences, the Borda Count will be familiar to voters, as it is currently used for weekly top 25 rankings. In the Borda count, every member of a 100 person committee would rank 75 teams for the at-large slots. A team would receive 75 points when ranked first, 74 points when ranked second and on down to one point when ranked 75th. Although this system can be prone to strategic attempts to game it if used with a secret ballot for elections where there are candidates who inspire both strong support and opposition, it is quite appropriate for this less partisan voting process -- especially with every voter having to share and be ready to defend his or her ballot with the rest of the committee. After the initial vote, the point totals would be tallied. The 29 teams with the highest point totals would receive At-Large bids to the tournament and the final eight play-in teams would be selected in a second round of voting. Round two of voting to pick the final eight teams: We believe that the first 29 winners for at-large slots in the tournament will rarely be controversial. It’s the “bubble teams” that are the source of dispute, which we seek to address with our recommendation for the second round of voting. Voters again will rank teams that are not yet in the tournament, but a different voting method will be used to determine the final eight teams: choice voting, also called the single transferable vote (STV). This system ensures that each of the final eight teams has a real constituency of support among our 100 experts casting ballots. For that reason, it will better ensure that the final selection of “bubble teams” doesn’t overlook teams that some people think are highly deserving, but others may not know much about due to coming from a less well-known conference or perhaps finishing the season strongly after a poor start. Choice voting is used in various governmental elections, including by all voters for at least one level of government in Australia, Ireland, Northern Ireland, New Zealand and Scotland, along with U.S. cities like Minneapolis (MN) and Cambridge (MA). Since the 1930s, it has also been used for nominations for the Oscars (see OscarVotes123.com) to ensure that the five nominees in each category are fully representative of the views of Academy of Motion Picture voters. Seeding the teams: Since regional brackets and seeding are processes that include elements that are more qualitative than quantitative, we for now will leave it to the committee itself to determine those key decisions. These experts will deliberate and make specific cases for certain teams to be seeded at certain places while also taking into account geographical regions and exciting matchups. They obviously should factor in how the teams were ranked in the voting process, however, and we would urge transparency about what criteria governs decisions and periodically have a formal review process to see if a more objective, vote-driven process could improve the process. Conclusion: There is nothing more frustrating for athletes, coaches, and fans than missing out on a chance to compete for a national championship because of a murky, nontransparent decision process occurring in the back rooms of the NCAA tournament selection committee. Basketball teams deserve to know why they have accomplished their goal or failed, why all their hard work and devotion to their school has been rewarded with a trip to the Big Dance or the NIT. We believe that our recommendations would both improve the transparency of the NCAA tournament selection process and make it more likely that the most deserving teams will get a chance to feel some March Madness. By adding an effective electoral system and a more diverse committee of voters to the selection process, we could make one of the most fun playoffs in sports even better.